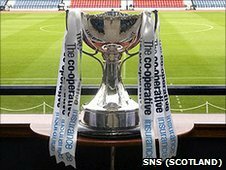 First Division Raith Rovers claimed a famous scalp as Mark Ferry's goal sent Hamilton Accies out of the Co-operative Insurance Cup at Stark's Park. Accies were aiming for a morale-boosting cup win following two successive 4-0 defeats in the SPL. But Billy Reid's side lacked a cutting edge and Joel Thomas spurned a number of changes against Rovers. Ferry grabbed the winner when he forced the ball home after Gregory Tade's effort was parried by Tomas Cerny. 93:25 The match gets underway. 90:00+1:43 Direct free kick taken by Tomas Cerny. 90:00+1:43 Booking The referee shows Jamie Mole a yellow card. 90:00+0:56 Substitution Allan Walker leaves the field to be replaced by Douglas Hill. 90:00+0:56 The assistant referee signals for offside against Jamie Mole. 89:23 Attacking throw-in by James McAlister (Hamilton). 88:37 Goal kick taken long by David McGurn (Raith). 86:51 Grant Murray challenges Douglas Imrie unfairly and gives away a free kick. Derek Lyle shoots direct from the free kick, save made by David McGurn. 85:53 The official flags Gregory Tade offside. Direct free kick taken by Tomas Cerny. 84:58 Free kick awarded for a foul by Mark Ferry on Douglas Imrie. Douglas Imrie produces a strike on goal direct from the free kick, save by David McGurn. 83:36 Penalty taken by Gregory Tade is saved by Tomas Cerny. Raith 1-0 Hamilton. 82:46 Booking Caution for Douglas Imrie. 82:35 Booking Simon Mensing receives a caution. 82:15 Booking Derek Lyle is given a yellow card. 81:16 Allan Walker takes the inswinging corner, Penalty awarded for an unfair challenge on Gregory Tade by Derek Lyle. 78:26 Defending throw-in by Craig Wilson (Raith). 78:26 Substitution John Baird goes off and Jamie Mole comes on. 77:41 Corner taken by Derek Lyle, Grant Murray makes a clearance. 77:20 Goal kick taken long by David McGurn (Raith). 77:01 Shot by James McAlister from deep inside the penalty area misses to the right of the target. 75:02 Corner from left by-line taken by Marco Paixao. 73:57 Attacking throw-in by Derek Lyle (Hamilton). 71:38 Substitution Gavin Skelton leaves the field to be replaced by Derek Lyle. 71:22 Goal kick taken long by David McGurn (Raith). 69:35 Corner from right by-line taken by Gavin Skelton. 68:44 Gavin Skelton takes a inswinging corner from the right by-line to the near post, clearance by Gregory Tade. 67:14 GOAL - Mark Ferry:Raith Rovers 1 - 0 Hamilton Mark Ferry finds the back of the net with a goal from inside the six-yard box low into the middle of the goal. Raith 1-0 Hamilton. 66:47 Attacking throw-in by James McAlister (Hamilton). 66:09 Goal kick taken long by Tomas Cerny (Hamilton). 65:20 Shot by Allan Walker from deep inside the six-yard box clear the bar. 64:15 Gavin Skelton takes a inswinging corner from the right by-line played to the near post, Gregory Tade makes a clearance. 64:06 Attacking throw-in by Martin Canning (Hamilton). 63:32 Attacking throw-in by Allan Walker (Raith). 62:53 Defending throw-in by Simon Mensing (Hamilton). 62:36 Defending throw-in by Simon Mensing (Hamilton). 62:12 The assistant referee signals for offside against Douglas Imrie. Direct free kick taken by Grant Murray. 61:41 Willie Dyer gives away a free kick for an unfair challenge on Flavio Paixao. Direct free kick taken by Gavin Skelton. 60:36 Foul by Grant Murray on Douglas Imrie, free kick awarded. Direct free kick taken by Marco Paixao. 59:36 Attacking throw-in by John Baird (Raith). 59:05 Shot on goal by Douglas Imrie from inside the box goes harmlessly over the target. 58:45 Defending throw-in by Willie Dyer (Raith). 58:40 Attacking throw-in by Grant Gillespie (Hamilton). 57:43 Douglas Imrie takes a inswinging corner from the right by-line to the near post, clearance made by Gregory Tade. 56:41 Simon Mensing takes the free kick. 56:41 Substitution (Hamilton) makes a substitution, with Jonathon Routledge coming on for Gary McDonald. 56:41 Substitution (Hamilton) makes a substitution, with Grant Gillespie coming on for Joel Thomas. 56:41 Iain Davidson challenges Douglas Imrie unfairly and gives away a free kick. 56:02 Defending throw-in by Craig Wilson (Raith). 54:57 Defending throw-in by Craig Wilson (Raith). 54:24 Defending throw-in by Simon Mensing (Hamilton). 54:08 Grant Murray fouled by Douglas Imrie, the ref awards a free kick. Grant Murray restarts play with the free kick. 52:04 Corner taken right-footed by Allan Walker to the near post, Martin Canning makes a clearance. 51:06 Corner taken by Allan Walker from the right by-line played to the near post, Gary McDonald manages to make a clearance. 49:59 Attacking throw-in by Martin Canning (Hamilton). 49:31 Attacking throw-in by Willie Dyer (Raith). 49:06 Free kick awarded for an unfair challenge on Stephen Simmons by Gavin Skelton. Direct free kick taken by Grant Murray. 46:55 Attacking throw-in by Gary McDonald (Hamilton). 45:00+0:46 Attacking throw-in by James McAlister (Hamilton). 44:27 Gregory Tade gives away a free kick for an unfair challenge on Gavin Skelton. Free kick taken by Tomas Cerny. 43:31 Defending throw-in by Craig Wilson (Raith). 42:39 Goal kick taken long by David McGurn (Raith). 42:26 Effort from outside the box by Gary McDonald goes wide right of the target. 41:30 Goal kick taken long by Tomas Cerny (Hamilton). 41:08 Gavin Skelton concedes a free kick for a foul on Stephen Simmons. Free kick taken by Stephen Simmons. 40:50 Goal kick taken long by Tomas Cerny (Hamilton). 40:10 Attacking throw-in by Willie Dyer (Raith). 38:12 The referee blows for offside. Martin Canning takes the free kick. 37:28 Defending throw-in by Craig Wilson (Raith). 36:41 Free kick awarded for an unfair challenge on Mark Ferry by Gary McDonald. Iain Davidson takes the free kick. 36:34 Goal kick taken long by David McGurn (Raith). 35:47 Effort from just outside the area by Douglas Imrie goes over the bar. 35:11 Inswinging corner taken left-footed by Gavin Skelton played to the near post, clearance made by Gregory Tade. 32:37 Stephen Simmons challenges Douglas Imrie unfairly and gives away a free kick. Direct free kick taken by Tomas Cerny. 29:54 Free kick awarded for a foul by James McAlister on Gregory Tade. Stephen Simmons takes the direct free kick. 29:23 Stephen Simmons concedes a free kick for a foul on James McAlister. Direct free kick taken by Martin Canning. 29:06 Defending throw-in by Willie Dyer (Raith). 28:51 Defending throw-in by Willie Dyer (Raith). 28:46 Defending throw-in by Willie Dyer (Raith). 27:48 Corner taken right-footed by Allan Walker from the right by-line to the near post, Martin Canning manages to make a clearance. 26:41 James McAlister challenges John Baird unfairly and gives away a free kick. Shot on goal comes in from Allan Walker from the free kick, Tomas Cerny makes a save. 26:18 Free kick awarded for a foul by Joel Thomas on Iain Davidson. Grant Murray takes the direct free kick. 25:52 Goal kick taken long by Tomas Cerny (Hamilton). 25:09 The referee gives a free kick against Gavin Skelton for handball. Direct free kick taken by Stephen Simmons. 23:46 Free kick awarded for a foul by Martin Canning on Stephen Simmons. Iain Davidson has a direct shot on goal from the free kick, Simon Mensing manages to make a clearance. 23:11 Outswinging corner taken by Allan Walker, Brian McQueen manages to make a clearance. 22:55 Corner taken right-footed by Allan Walker from the right by-line to the near post, Flavio Paixao manages to make a clearance. 22:21 Allan Walker takes a outswinging corner from the right by-line played to the near post, clearance made by Gary McDonald. 22:01 Attacking throw-in by Craig Wilson (Raith). 20:02 Goal kick taken long by Tomas Cerny (Hamilton). 19:02 Free kick awarded for an unfair challenge on John Baird by Brian McQueen. Willie Dyer has a direct shot on goal from the free kick. 17:53 Goal kick taken long by David McGurn (Raith). 17:23 Shot from long range by Marco Paixao misses to the left of the goal. 16:42 Marco Paixao concedes a free kick for a foul on Grant Murray. Direct free kick taken by Grant Murray. 14:53 Shot from just outside the box by Flavio Paixao goes over the bar. 13:35 Attacking throw-in by Craig Wilson (Raith). 12:53 Free kick awarded for a foul by Douglas Imrie on Craig Wilson. David McGurn restarts play with the free kick. 12:12 Attacking throw-in by Douglas Imrie (Hamilton). 9:42 Defending throw-in by Simon Mensing (Hamilton). 8:47 Free kick awarded for a foul by Gavin Skelton on Stephen Simmons. Stephen Simmons takes the free kick. 7:24 The assistant referee flags for offside against John Baird. Tomas Cerny takes the direct free kick. 6:11 Free kick awarded for an unfair challenge on Stephen Simmons by Gavin Skelton. Free kick taken by David McGurn. 5:51 Defending throw-in by Craig Wilson (Raith). 5:37 Attacking throw-in by Douglas Imrie (Hamilton). 5:19 Attacking throw-in by Douglas Imrie (Hamilton). 3:09 Goal kick taken long by David McGurn (Raith). 1:04 Attacking throw-in by James McAlister (Hamilton).